I’ve always said that all human innovation comes from our deep and innermost desire to improve the quality of our lives and have less to deal with in a day-to-day basis. So basically what I’m saying is that all human innovation comes from our inherent aptitude towards laziness. Now, don’t jump in your chair and exclaim how this is preposterous – you know deep inside your heart and soul that I’m right. The more a technology is making your life easier, the more you like it. That’s why smartphones, for example are so popular these days – they introduce a level of simplicity never seen before. You no longer have to know anything about setting up a computer or Internet connections and modems in order to browse the Web. You may not know how your iPhone works, but you know how to use it and when you want to google something you don’t need to find immediate access to a PC in order and go through the tedious process of sitting down and switching the machine on, then setting up the Internet connection and finding what you need. No, you just get your smartphone out of your pocket and proceed to googling. Imagine you had the opportunity to control everything from your lighting to your heating and entertainment system in your home, all from your phone. Would you take it? Of course you would – it would make your life infinitely easier and spare you lots of effort and this is one of the things we, as humans strive for. Well, I have good news for you – the time is already here. You no longer need complex systems and high-tech remote controls to manage your home. Now there is an app for that. Although some from of specialized hardware is still needed, it’s not like it used to be back in the day. The idea of automation isn’t new by any stretch of the imagination, but it involved special panels and expensive extensions and gear combined with nearly Sci-Fi remote controls. The systems did work, but they didn’t do it seamlessly and even the few people who could actually afford such an eccentric home improvement were not completely satisfied with the results. Needless to say they weren’t getting what they were expecting, especially after they had a spent a small fortune on the tech. Also, the automation process was long and tedious and had to be performed by highly paid technicians. Things are a lot simpler today. You go to the store, buy the items and then download an app on your smartphone (in the case of Philips Hue your iPhone) and you’re done. Easy to set up, easy to use. 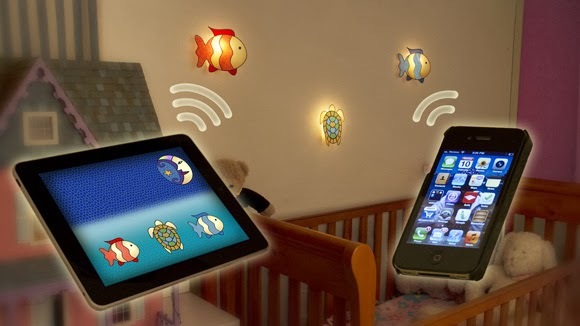 The technology is pretty simple – there is a base station that connects to your iPhone and the light bulbs have a wireless connection to it. Other than that, they are placed in your normal sockets.. Like I said – easy to set up and easy to control. Speaking of control, the app gives you a complete creative freedom to tweak the light as you see fit – from brightness to color. Being Philips and having the ability to change colour are two prerequisites for the Hue to be quite expensive. If you want the delight of being able to wirelessly control your lighting and impress your friends with your magic skills, but don’t want to invest that much money in the privilege, then LightWaveRF’s CFL bulbs are just for you. Although they don’t give you color control, you still have the ability to control the brightness from your iOS so it’s a nice alternative albeit not as glamorous as the Hue. Rose is passionate about technologies and mobile phones. She works as a coordinator at http://www.perfectcleaning.org.uk/house-cleaning-de-beauvoir-town-n1/ and has a lot of knowledge to share.